According to a Field Poll (pdf) released last Wednesday, former Secretary of State Condoleezza Rice leads a crowded field of potential candidates for California’s open U.S. Senate seat in 2016. It’s a notable occurrence that Rice, a Republican who has served in two White House administrations, has support from 49 percent of voters in a Democratic-stronghold state. But the more remarkable revelation from the poll is not only who came in first but also who finished a close second at 46 percent: California Attorney General Kamala Harris. Unfortunately, this dream matchup between two of the nation’s best and brightest thinkers is not going to happen. Despite calls from black conservatives and a clear indication that she would be competitive, Rice is adamant that she has no interest in running for the office. But California politics aside, Rice should run because of what it would mean to black America: A Rice-Harris election would put the nation on notice that black women are here to claim their share of national leadership. Though black women have long held seats in the U.S. House of Representatives, there’s only been one black woman in the Senate in its 226-year history—Sen. Carol Moseley Braun (D-Ill.)—who’s been out of office for over 15 years. At the moment, when the upper chamber convenes to debate the most important issues facing the country—from health care to homeland security—there is no black woman’s voice in the room. There’s never been a black woman on the Supreme Court. And Republicans seem intent on blocking the pending confirmation of Loretta Lynch as attorney general—she’d be only the second black woman since Rice to serve in a president’s Cabinet. This is unacceptable. By contrast, black women are increasingly taking the political and economic helm in black America. More than 3 in 4 black homes have black women as householder, responsible for the majority of the $1.1 trillion in black buying power. On the strength of black women, black voter-participation rates in 2012 were higher than white voter-participation rates for the first time in history. It’s been specifically black women’s votes that have determined recent election outcomes. It is time this electoral and economic power translates into black women holding statewide office. And there would be no better two women to become the face of this imperative than Rice and Harris. If they were to campaign against each other, it would be historic, and they would own the national spotlight. Should the poll numbers hold, it would be the first time ever that black women were nominees of both political parties in a senatorial election. Rice could become the first black female Republican senator. A victory by Harris would immediately thrust her into conversation about eventually becoming the nation’s first black female president. Each embodies the American story—Rice’s rise from her start in Jim Crow-era Birmingham, Ala., and Harris’ immigrant parents becoming respected scholars in this country. They would both bring a unique perspective born of their upbringings, their cultural experience and their professional knowledge that would enhance the discourse and help highlight issues of particular concern for the black electorate. With both being black women, race and gender differences would be taken off the table, allowing their policy debates to take center stage. 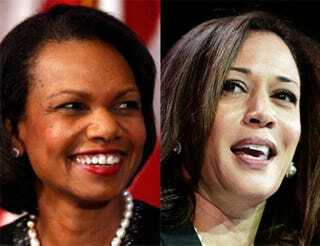 They have both offered their competing visions for America—Rice at the 2012 Republican National Convention and Harris at the 2012 Democratic National Convention—and the nation would have the opportunity to evaluate two eloquent black women with different worldviews engage in reasoned exchanges on the best way forward for their state and the nation. The great among us put their personal desires aside for the greater good—it’s why Rice should run. Even though she’s said she can’t see herself running for office, she’s been clear that she maintains an interest in public service, K-12 education and the state of California. A Senate campaign allows her to act on those interests and, along with Harris, raise the glass ceiling for black women on the national political stage. Our needlessly contentious national politics would benefit from seeing a Rice-Harris race, run with mutual respect on the issues and with black women as the face of the changed politics that citizens want.